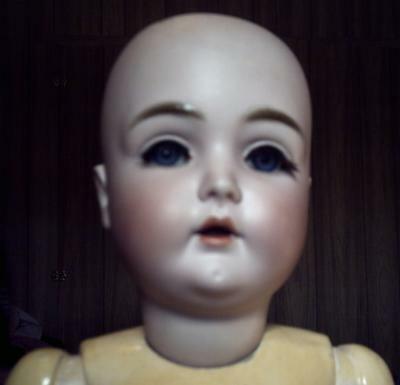 I have this beautiful Kestner doll, no wig or clothing. She has gorgeous blue sleep eyes and real eyelashes, not painted on. She measures about 2 feet long. An older lady that used to babysit me left her to me in her will. I would love to know what year she was made and a possible value on her? Also, how do I go about getting her clothes and wig? I can find NO dolls online just like her so I'm assuming she may be rare. The back of her head says "Made in Germany 13 171. Hope this helps with the indentification! Thanks! Your lovely doll was made after 1910 by the Kestner Company. Kestner made wonderful dolls, he was called the "King of Dollmakers", the quality was so good. Mold 171 is sometimes known as "Daisy" by collectors. As for rarity, this mold is more rare than some of the more common German dolls, but does come up regularly on ebay for sale. A 24" doll in good condition will fetch anywhere between $200 and $450. If you want to sell her, a listing on ebay with clear photos of her head particularly, with a shot of the head markings is helpful. Mention if she has sleeping eyes, any clothes and wig, and carefully examine her head all round for any hairlines/damage/scuffs etc. Body is important but since most of the value is in the head, that's what collectors like to have clearly photographed and described. Good luck if you decide to sell her, she's lovely.